The great room of the Residence One. 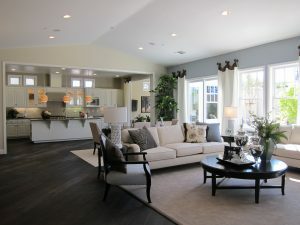 The models at The Enclave at Waverly Park in Mountain View opened last Saturday to rave reviews! Over 1,000 people joined us to celebrate the opening of our latest community of distinction(tm). Guests were excited by the uniqueness of new single-family homes in this location on this size lot. Check out more photos of the models on our Facebook page. 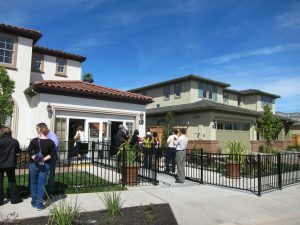 A gathering in front of the sales office at The Enclave Model Grand Opening. Why wait? Â Come visit us at The Enclave and see these stunning homes for yourself!